I am a food guide. 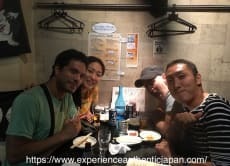 I can introduce nice and unique cuisine and can be a simple local conversation partner for you at an Izakaya. I worked for advertisement agency and self-employed marketing researcher for more than 10 years in Tokyo. So I used many restaurants and bars for my business meeting quite often. I want to show you around to see our local life along Chuo-Line, which is located just west of Shinjuku, and has been the most popular place to live for young generations. One of the fact that differentiates this from other places is the number of pubs and restaurants over there. They are mostly owned by private business and you can hardly find big commercial power.